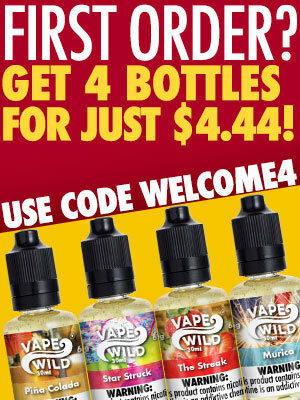 The VapeWild Welcome Sample pack is the perfect way for customers that are new to VapeWild to try some of our most popular flavors, allowing you to pick out four 30ml bottles for only $4.44 when you use the code WELCOME4* (including shipping)! It’s our welcome wagon offering to you and an amazing deal for 120mls of juice - if this isn’t the best way to try a company, we’re not sure what is. All you need to do is pick out your nicotine strength, select your preferred VG/PG ratio, choose four flavors, add it to your cart, use the coupon code, and you’re good to go!